The Torch to Rose effect has been around for quite a few years. This is a brand new version of the prop, which makes the entire trick completely automatic! That's right...no more covering the flame, no more sliding the rosebud, no more hoping the flame extinguishes when you want it to! This latest iteration is SPRING-LOADED....all you do is release the rosebud and it instantly and automatically springs into the correct position and automatically extinguishes the flame! Light the torch and perhaps toss a fireball or two from it...then blow it out and it instantly transforms into a beautiful red rose! 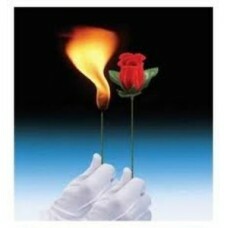 Or show a lit torch and flick a silk toward it... and it instantly becomes a rose! This is beautiful, VISUAL magic for your parlor or stage shows. Comes complete with the well-made gimmick and complete instructions. NOTE- As this trick uses fire, purchaser must be 18 years of age or older. Buyer assumes all risk in use!